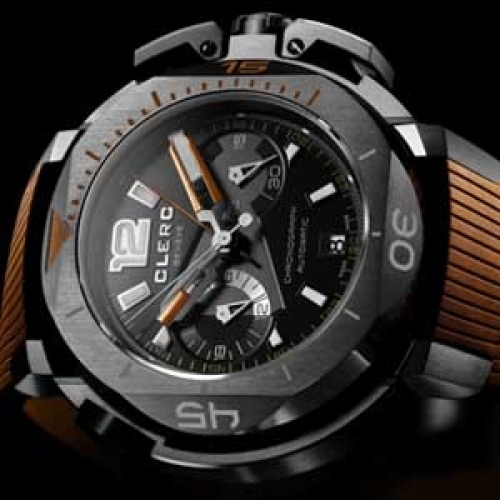 Joining the prestigious Hydroscaph collection from Clerc Genève, the new "Clockwork Orange" Hydroscaph Limited Edition Central Chronograph is possibly one of the most innovative instruments to measure short times. 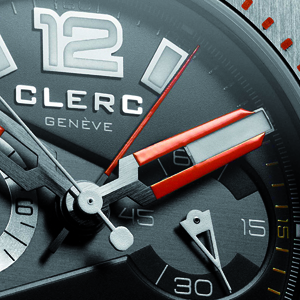 Its exclusive, automatic Clerc C608 calibre features a central chronograph for complete legibility. No difficult-to-read, off-centre counters but a central chrono hand backed by a second dragging hand to display minutes. Inside and out, this is a timepiece that refuses any form of compromise. Its powerful case incorporates a full 103 parts. Lateral reinforcements guarantee water-resistance to 500 metres. Crafted from black DLC steel and mounted on a rubber strap, this dive chrono is a spectacular demonstration of creativity by Clerc.